Join Me on Norwegian Breakaway! I have attended nearly every ASTA Global Convention, TRADEShow or World Travel Congress since 1991, when the event was held in Taipei. 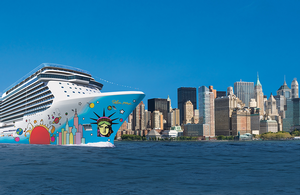 This year will be no exception when I board the Norwegian Breakaway on Sept. 14 in New York City for ASTA’s seven-day cruise to Bermuda. This is the first time the American Society of Travel Agents has held its annual convention at sea, so I’m looking forward to a very different and more intimate kind of experience. I was aboard Norwegian Breakaway in 2013 for one of its inaugural cruises and it’s an amazing ship, full of great dining, entertainment, activities and lavish accommodations. ASTA events used to be very large conferences of 5,000 or more. The travel agency business has changed dramatically over the past 25 years, as have the ASTA conventions. But one thing remains the same: ASTA must continue as a leading industry organization supporting the travel agency community—and the annual convention produces revenues that help support ASTA. ASTA’s Global Convention also is a great place to network, hear great speakers (last year we heard from Hillary Rodham Clinton), and attend informative seminars about the travel agency business. This year is no exception as ASTA has developed a great agenda of speakers, including Peter Greenberg, travel editor for CBS News. Greenberg will talk about the changing face of tomorrow’s leisure travel consumer, though I’m sure he’ll have much to say about almost any topic involving the travel industry and travelers. Peter is a great speaker and a good friend, so I certainly will enjoy his remarks.